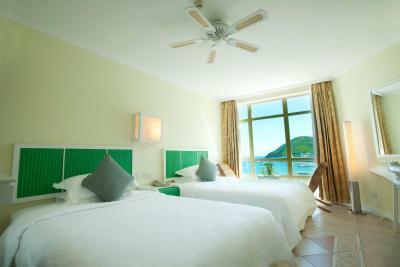 Lock in a great price for Sunshine Resort Intime Sanya – rated 8.6 by recent guests! Second time visiting this resort. The best place to stay, especially if you have kids. 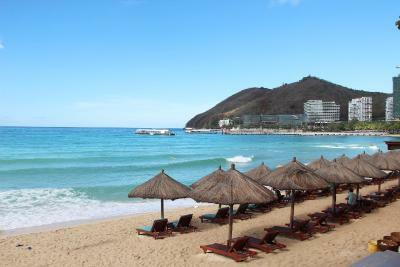 Right at the beach, although the pool was quite big and beautiful scenery, many nearby restaurants and markets. 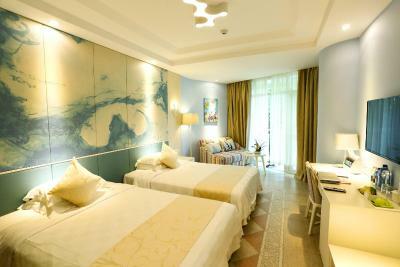 Friendly staff, clean rooms and comfortable beds. 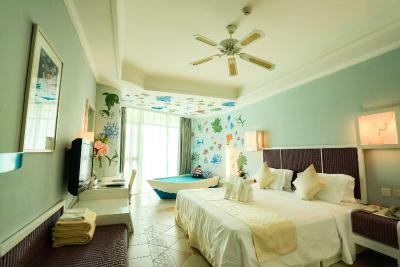 The family rooms have very cute bed for kids. Would recommend this hotel absolutely and my next vacations will definitely stay there again. Room not ready so I had to hang around in the garden until 4.. Manager was very nice and helpful. The pool & grounds were beautiful but not enough sunbeds.. Nice staff down at the restaurant & live music you can watch from the balcony in the evening. Staff were very nice, they let me check in two hours early and gave me a late check out. I was just a little confused checking out and waiting for my deposit back because no one was explaining why I had to wait. So a little communication that the cleaners need to check the room before returning your deposit would be great. The hotel is beautiful and has their own cabanas on the beach free for guests to use which is amazing because they are all under big shady umbrellas. Room was bright and beautiful. Pillows were lovely, however the bed was uncomfortable and could use a new mattress. But overall it was a lovely holiday. I was staying in a different hotel. 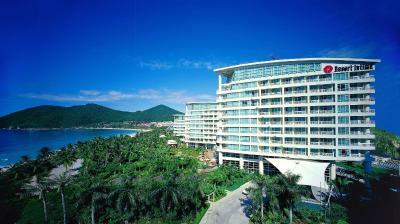 One day, with my family, i visited my relatives at Intime resort and i really loved it so we decided to extend our stay in Sanya and booked a seaview room at Sunshine Intime resort. We loved the private beach so much. I think it was the biggest factor for us to choose this resort. Just fantastic. Great Location. Conveniently located near the beach. No problem with sunbeds, good location, beach is nice and clean. Pools are big enough. 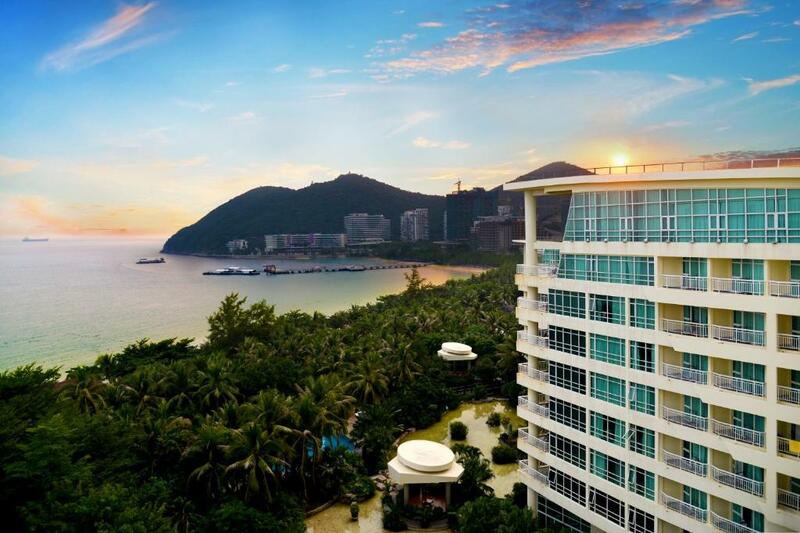 Overlooking scenic Dadonghai Bay, Intime Sanya offers relaxing beach getaways with 3 outdoor pools including 1 children pool, a fitness center and 5 dining options. 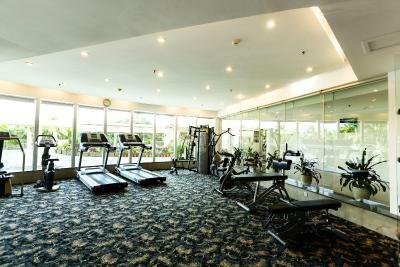 Spacious units come feature flat-screen TVs and free internet. Boasting floor-to-ceiling views of the ocean or landscaped grounds, air-conditioned rooms feature pleasant pastel interiors. 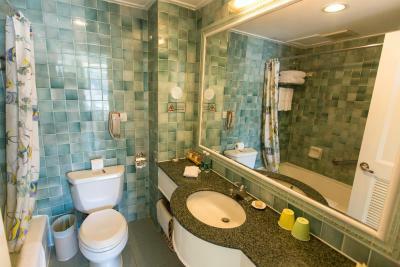 In-room conveniences include a hairdryer, safe and tea/coffee making amenities. 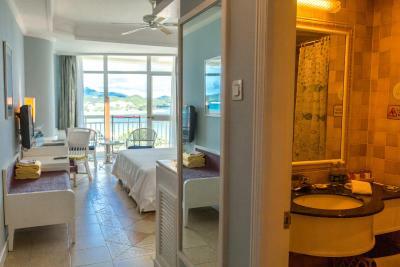 Each room also features with bathrobes and slippers for children. 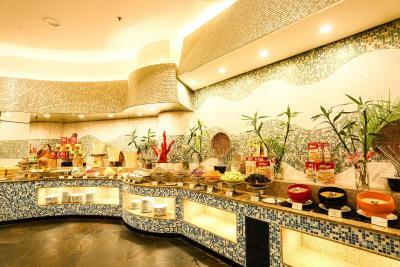 Shopping malls, western and local restaurants, bars can be found within 5 minutes walking distance. 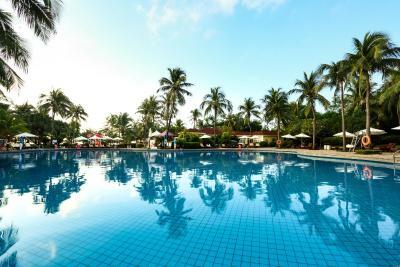 Dadonghai Amusement Park is a 10-minute walk away while downtown Sanya is a 13-minute drive from the resort. 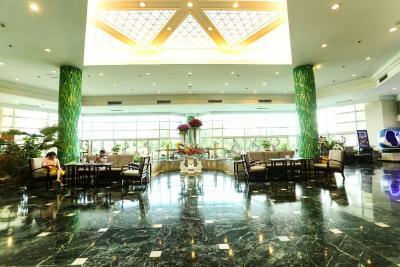 Sanya Phenix International Airport can be reached in a 40-minute drive. 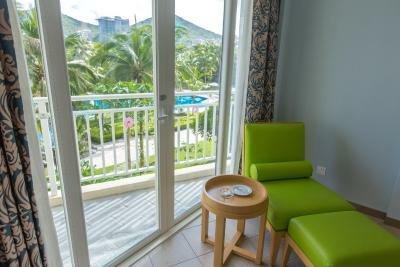 Guests can relax with soothing massages or play billiards and chess in the games room. A tour desk can help arrange water sports activities and sightseeing trips. Children can have a fun time in 2 kid’s club and water facilities. 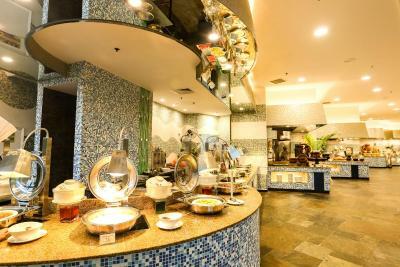 Dining highlights include seafood specialties at Lakeside BBQ Buffet Restaurant and Chinese cuisine at Oceanic restaurant. 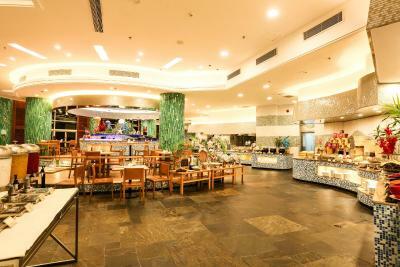 There is also a Japanese restaurant, steak house and a café. 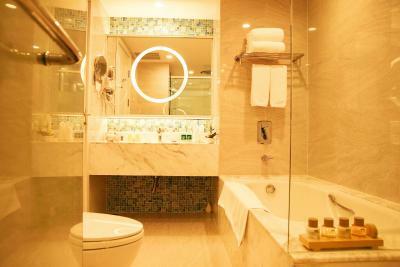 This is our guests' favorite part of Sanya, according to independent reviews. 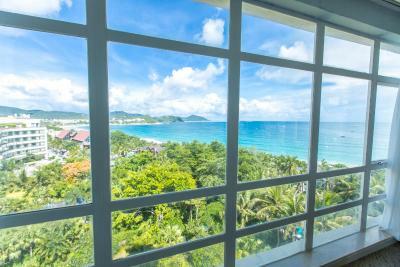 This property also has one of the top-rated locations in Sanya! Guests are happier about it compared to other properties in the area. 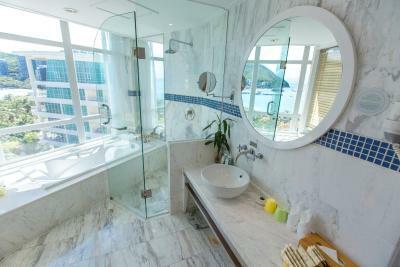 This property is also rated for the best value in Sanya! Guests are getting more for their money when compared to other properties in this city. 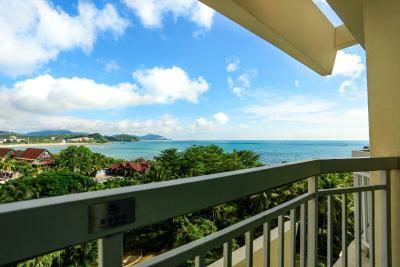 뀐 Located in the top-rated area in Sanya, this property has an excellent location score of 9.3! 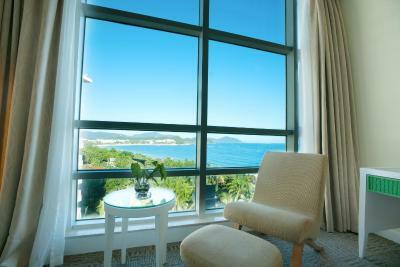 When would you like to stay at Sunshine Resort Intime Sanya? 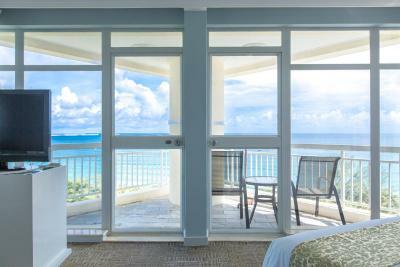 Opening out to 270° stunning sea views, this suite features a private balcony with outdoor seating. It has a living room and a bedroom. 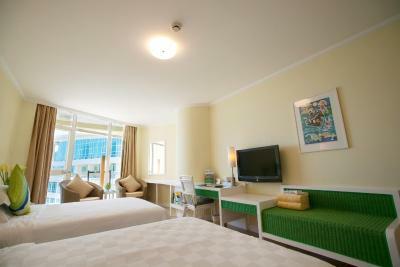 This room features with a double bed and enjoys city view. This room cannot accommodate an extra bed. 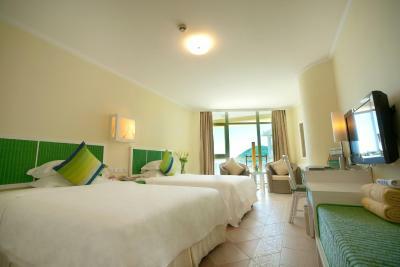 With 2 single beds, this twin room features air conditioning, satellite TV and a balcony with sea views. 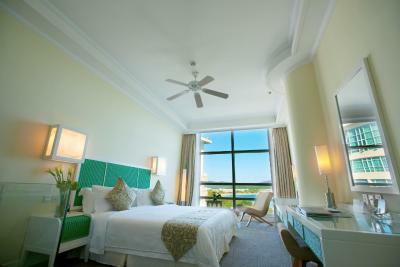 With 2 single beds, this twin room features air conditioning, a mini-bar and sea view through floor-to-ceiling window. 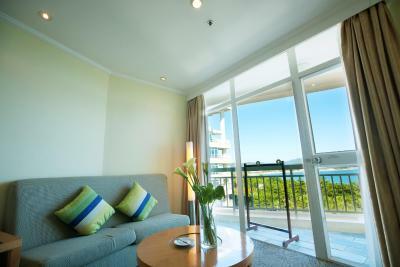 This family room has a balcony with sea view and mini-bar. 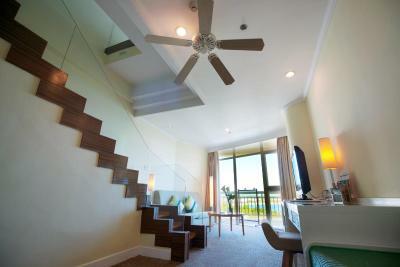 This loft style suite features a balcony with sea view, mini-bar and flat-screen TV. the hotel is located on the beach side. local and international dining options, beach side sea food restaurtnats within 2 minute walking distance, bar and KTV within 5 minutes walking distance. shopping mall with in 2 minutes driving distance. 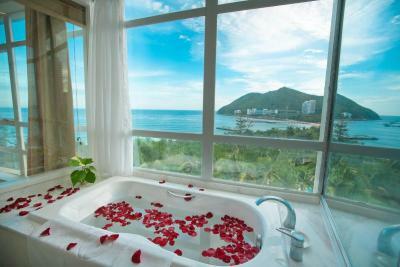 House Rules Sunshine Resort Intime Sanya takes special requests – add in the next step! Sunshine Resort Intime Sanya accepts these cards and reserves the right to temporarily hold an amount prior to arrival. Please note that the extra bed fee and breakfast charge may vary during Spring Festival period. More information, please contact the property directly. 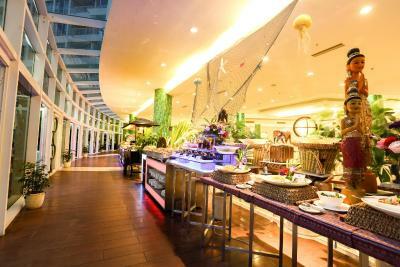 For breakfast, children below 3.9 feet dine for free; children from 1.2-4.9 feet dine with discounted rate. 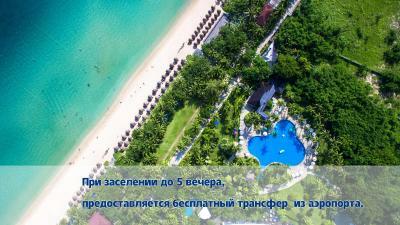 Please inform Sunshine Resort Intime Sanya of your expected arrival time in advance. You can use the Special Requests box when booking, or contact the property directly using the contact details in your confirmation. The room we got was smelly so we had to change it. A lot of people spliting to the swimming pool- that was awful! Stuff speaks a little English so is really hard to communicate. The hotel is quite old. During the breakfast- mess everywhere doing by hotel guests. Huge language barrier for non chinese nor russian native speakers. Breakfast had many options but not well executed: broken bread toaster, croissants weren´t really croissants but actually "croissant-like" bread made with dough for other purposes. Staff seemed angry and offered little help during the morning. "Eggs guy" only answered me in russian on the first morning, seemed to have learned english during the night since on the second morning he asked if I wanted "one or two eggs sunny side" Room was old with lots of rust in the shower area and mold building up in several places. Also had some type of bugs living around the lavatory. Hard mattress, which although personal issue, curved our decision of cutting short our stay. There were quite a few "small things" that added up to some overall disappointment with the place. 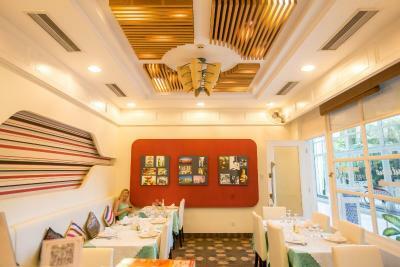 Some of it had to do with language issues; the two main languages used at Intime Resort (and in Dadonghai Bay area) are Chinese and Russian, and English is an afterthought. I realize that English-speakers may not be the majority of the guests here, and there's no law that says every resort in the world has to cater to English-speakers-- but its marketing does seem to imply that English will be spoken here-- it made it more difficult for me to resolve the issues I was having, such as construction in the room next to mine (they did finally move me to a different (and better) room, but it took a lot of effort to work it out, including having to wait for an English-speaking manager to be on duty. There were a few other communication issues too, and some of the people didn't want to help me, such as a Russian-speaking customer service person who just hung up on me when I requested to be transferred to the English-speaking staff. So, not to go on and on about every little issue, but overall it turned out to be a big one. Second, I think the food was only so-so, for the type of place it is. There was plenty of it, but the quality wasn't so great. Soggy, reheated crab legs, sushi that was frozen solid, grisly meat, undercooked rice and pasta... Meh. I finally just started eating at restaurants outside the hotel but I would've liked the expensive buffet to be worth the cost. The best thing about InTime Resort is the private beach access. It's also very clean, and *some* of the staff were helpful and friendly. Staff’s limited knowledge of english was a real problem sometime. However the staff was friendly but the communication gap is way too much. Great location. 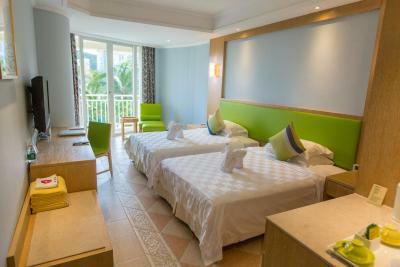 Easy access to the beach and some western fast food outlets such as Mcdonalds, Pizza Hut and starbucks were nearby. I've been staying here since 2004 and it seems now that the hotel guests from being well balanced by nationality are increasingly 90% from one foreign country (not China). As an English person who lives in Beijing, I'm being spoken to as if I am from that foreign country. 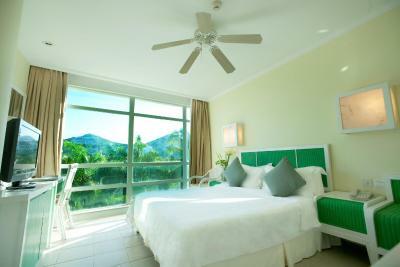 Brilliant location, wander straight from hotel through the well established tropical garden direct onto a safe beach. Amazing breakfast. 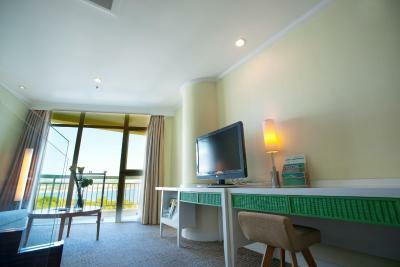 Rooms are well cleaned and beach towels are provided which are replaced every day if used. Because of the design lifts only connect 5 floors so no waiting for a lift. What we didn't like has nothing to do with the hotel itsself, more with the guests staying at it. Almost all of them are Russian, so everything is only translated to Russian, no English is found. 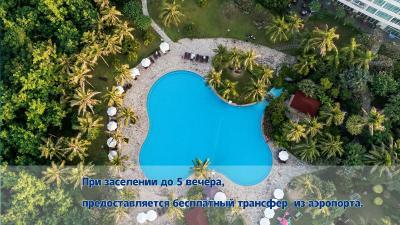 They put their towels on the pool and beach beds early in the morning although they wont use them until late afternoon. We found that really annyoing and unfortunately the hotel Staff did not do or say anything against it. The Resort is really great. Even if the hotel is might be a bit older, everything is up to date and really taken care of. Every detail is very well locked after and you can tell that they love what they do. Mary and her Staff at the reception are just awesome! We had a bit problems with our flights and arrived one day late, so we send and email and she always replied and took care of our questions. When we arrived, she had already adapted our booking and send us a fruit basket to our room (which by the way we got a free Upgrade) because we arrived after dinner. We enjoyed our stay very much and would come back anytime! The children pool was closed and the other pool was too small, especially the sitting area around the pool. The way to get to the pool was not accessible at all, especially for little children and a stroller. The breakfast was not to our taste- for 6 days we stayed there. Most of the staff did not know eanglish at all. The staff, though did not speak english at all or not very well, was very kind, and everyone did there best to assist. The room was nice and comfortable. The kids club was good. The location is in the center of the tourist area. The price of Breakfast and Dinner Buffet. They could be cheaper. They are ok, but not for the price. Everything I liked in the hotel. These were my second ten days.I was enjoying a well-kept garden ,of a nice and varied breakfast of the silence and peace! On the last day of the night my flight has been delayеd ,changed and replaced with an early flight I had a car from the hotel arranged on time.А many tahanks! Аll has been great. The beds were very comfortable.I was on treatment in a hospital and I need after the procedure to rest. The manager of the hoteI very kind and smiling woman, has been so polite and provided me a quiet room,as I written when I booked the room. Always the room has been clean. The brekfast was many varied for every taste. 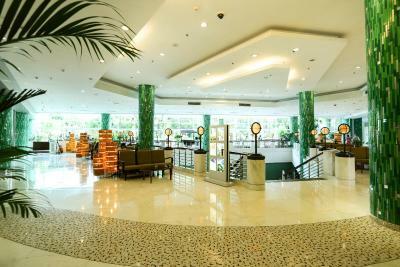 The hotel has a beautiful inner space, as a park in good condition. Thanks for the hospitality!